Atoll Explorer – All Inclusive Cruise. Please note we are unable to book the Atoll Explorer, it no longer sails and is permanently moored. Imagine a small intimate all-inclusive floating hotel in paradise – that’s the Atoll Explorer. From the first friendly welcome to the amazing deserted Maldivian Islands and the friends you will make for life on board the boat, you will never forget your Maldives Cruise. You will see so much more of this beautiful island group on a cruise than just booking an island and the prices are very comparable There are no pretension, only dedication and enthusiasm, to making sure that you are comfortable and enjoying yourself. There is no dressing up, the ambience is “laid back. Dress code is shorts and swimwear during the day and casual dress in the evening. For divers there is a full accredited dive school on board, if you don’t dive then you can while away the day on one of the many fantastic island the Atoll Explorer visits .Or simply relax on a desert island beach, with a bar set up for you – naturally! The Atoll Explorer is a very popular boat, it is rated 3 star by most UK travel agent and this Maldives Cruise is limited to just 40 people per sailing so it is essential that you book early to avoid disappointment. 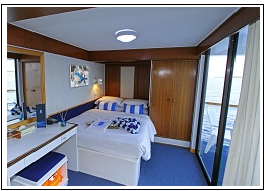 Atoll Explorer has 20 cabins, simply furnished with either a double bed or two single beds. All cabins have a window facing out to sea, and some come with a balcony. They are all equipped with air-conditioning, telephone, bathroom and wardrobe space. On board the Atoll Explorer, there are several facilities to make your Maldives stay more comfortable including a restaurant and bar for your dining needs. Relax while you cruise the Maldives. All food, drink, snacks are included The Atoll Explorer cruise is All Inclusive. The Atoll Explorer has 2 sun decks so you can relax in the sun while you take in the wonderful sights and sounds while you cruise the Maldives. There is also a Jacuzzi for you to soak away the day. 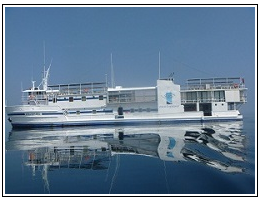 There is a small gift shop on board. Atoll Explorer has a fully equipped and professionally run diving team, as well as a full range of PADI beginners programs and courses the Atoll Explorer offers diving with Nitrox for certified enriched air Divers (and it is free) The diving is exciting and varies as the Atoll Explorer cruises the Maldives, giving you the chance to experience the fantastic diving areas in the Maldives. During your cruise you will encounter some of the most notable dive sites in the world. You will find Whale sharks, turtles, morays, lobster, octopus and Manta Rays as you discover the incredible underwater world that is the Maldives. The Atoll Explorer is more than a live aboard dive boat, meaning there is plenty to do, even if you do not dive. Snorkeling and exploring local islands to get a taste of the real Maldives. The Atoll Explorer offers the opportunity to cruise the Maldives and is as popular for non-divers as the itinerary allows you to visit great snorkelling reefs, a number of uninhabited islands and sand-banks. Snorkelling gear is available free on the ship. Picnics and BBQ’s are arranged by the crew. The restaurant serves international-style buffets, with indoor and open-air dining areas. The cruise is all-inclusive, including proprietary brands of spirits, a wide variety of cocktails, wine and beer. The nicely decorated bar is a great place to meet up with fellow guests for a few drinks before and after dinner, One night each week there is a sunset fishing trip and your catch is cooked on the BBQ. Bodu Beru is a Maldivian night, where the crew entertain you with drumming, singing and dancing and will encourage you to join in with them.